Baby Rutherford was born at 9:45 this morning (Feb 28th) in Macclesfield hospital. 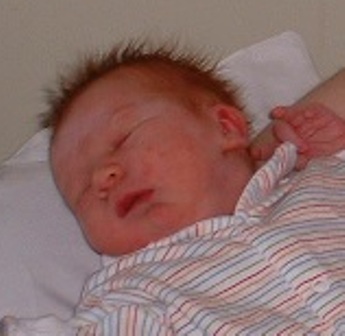 He weighed 7lb 8oz and has a shock of bright red hair. He currently has no name. Mum and baby are both very well – daddy is a bit shell-shocked. First pictures on Donna’s website. When we saw him, we knew instantly that he wasn’t an Andrew. So we’ve named him James Bramwell Rutherford. Or Spike. This entry was posted in Uncategorized and tagged jamesrutherford. Bookmark the permalink.